Memory Beads by LearnTools Inc.
(A) Plastic Fingers grip the Rod to hold Bead in place. (B) Grooves on the Rim give Tactile Feedback. Beads slide easily hold their place, held by the Fingers(A). Selecting Beads is easy due to the Tactile Sensation of the grooves around the periphery. Beads are made of non-toxic polypropylene (same plastic as used in milk bottles). All Colorants are FDA approved non-toxic. Rugged Abacus Construction means Beads won't come loose, even if the Rods are bent. Nothing in this world is completely unbreakable. If your Abacus gets broken, discard the Beads, as they would present a choking hazard. 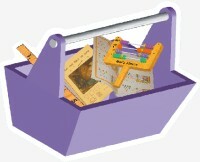 Care Instructions: To assure long life of the Grip Fingers (A), avoid putting Mac's Abacus in a Toy Box, where other items may press against the Beads. Also avoid placing objects on top of the Beads for any length of time. These types of actions could bend one of the Fingers, which may cause it to loosen its grip. Once the grip of a Bead is lost, it cannot be restored. 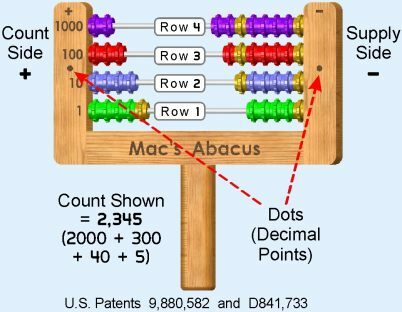 Always store Mac's Abacus by laying it on a flat surface or by holding it upright in a stand (The Handle is useful for this). Your Abacus Beads should maintain a useful grip for well over 200,000 moves under normal care.